A short train trip from Seoul to Suwon takes you to a couple of interesting places. 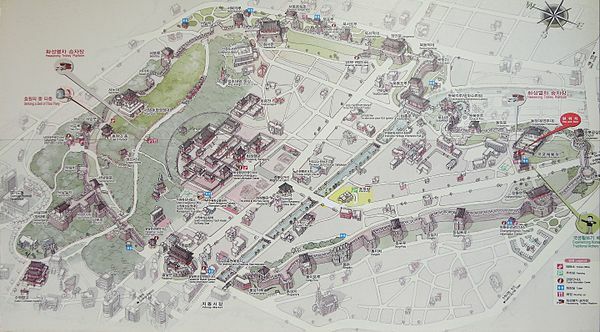 The Folk Village and Hwaseong Fortress are the main reasons to visit, but there’s also a palace, traditional markets, and good food. The area is known for ‘galbi.’ Late afternoon found us at the UNESCO World Heritage Site of Hwaseong Fortress. Spread out around the original city the fortress wall is about 3.5 miles in length. It is not very old, just over a couple of hundred years, but it has survived through wars and occupation. In places it has been repaired, or restored, using the original techniques and materials, so that it is almost complete. It looks new in places, but time will age it all together nicely. Still a few smaller buildings that were lost to floods, or wars, haven’t been reconstructed. It is an amazing place to explore and visit, and we hope to visit it again on a day with more time, and sunshine. It really gives you an idea of the scale of buildings of the past, and the amount of land covered by a fortress. It is huge. Having spent the most part of the day at the Folk Village we only had time to stroll and explore part of that length. We took a taxi from the train station to the northern tip of the fortress which was quite busy with tourist buses. Fortunately they were all leaving as we arrived. If you see the ‘balloon’ in the photo, that is a ride that goes up to allow a good view, especially at night and it was our plan to ride it. But as you can see it was a cloudy, hazy day so we decided not to. We started our exploration at the East Gate, technically called Changrongmun, but more usually called Dongmun. It is located to the far right of the map, near the little man and the garden outside the wall on the map. There is an area up near the northern gate where you can try out your archery skills, although we didn’t feel up to the task. There’s also a cafe and snack area near the parking area if you need a quick bite. We headed around the wall heading towards the north gate. This building is called Dongbuk Gongsimdon and it is the N.E. Observation Tower. It is kind of a weird oval shape and quite imposing. It was cool to be able to stand in some of the buildings and gaze out over the city below. In fact there were cool views all the way along the wall even on such a overcast afternoon. The were outposts, pavilions and other buildings scattered all along the wall. The wall walk is very popular with local walkers and joggers as well as tourists so sometimes it is better to be there at odd times. One of the nicest areas we found was around Dongbuk Gangnu Tower. After a while the tower became known more for being a place to hold feasts than for its original military purpose, and it was easy to see why. Below the tower lies Yongyeon Pond, now a public park, which was once pleasure pond for the nobility. The views from the pavilion were quite beautiful. To get to the pond from the wall you have to find the Bukammun North Secret Gate, which actually is quite easy to find nowadays. The other widows also have striking views, this angle shows the river that runs through the center of the fortress. You can walk along the wall and cross the river that way, but since we had already gone down to the pond level we followed a narrow path to see where it would lead. It led us towards the north floodgates, or Hwahonhmun. This is what you would cross if you stayed up on the wall. We went down some steep steps, following the flowing water until we came to the stepping stones across the river. The photo below is looking back the way we came. This is so us, leaving the ‘tourist’ trail to poke about, but we have so much fun that way. We continued on to the North Gate, Janganmun, along the outside of the wall so we could truly appreciate the size, height and shear bulk of the massive walls. We probably walked less than a mile, and obviously didn’t see everything, so I’d suggest either Hwaseong Fortress or the Folk Village, or you spend 2 days in Suwon. That’s probably what we’ll do next visit. It had been a long day so we hailed a cab back to the station and then made our way back to Seoul and our home away from home, The Seoul House. You may also enjoy Hwacha: A Korean ‘Rocket Arrow’ Launcher, Jeong-Dong Culture Night, and Beolcho: A Korean Tradition Of Maintaining Ancestral Grave Mounds. All photo credits to original owners, map to tourist site on web, rest to Debora & Elizabeth Marzec. ← The Best Kdramas of 2017? Part 2.